What Are the Uses & Benefits of Hawthorn? How Do I Take Hawthorn? Are There Any Side Effects of Hawthorn? How Do I Pick a Good Hawthorn Product? In order to help you find a good product we’ve researched & narrowed down the best hawthorn supplements on the market right now. 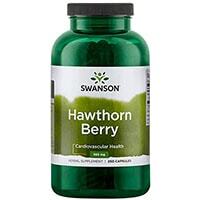 This is a powerful hawthorn supplement with 1.53mg per serving. It uses pure hawthorn berries and is offered at an excellent price. Nature’s Way is one of the largest manufacturers of supplements in North America. They follow Good Manufacturing Practices (GMP), and have all their ingredients third-party certified by TRU-ID. 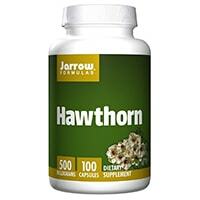 These are good hawthorn pills from a reliable, trustworthy company. Those with allergies or dietary preferences will appreciate the fact that this product is free of most common allergens – and it provides excellent value for the price. 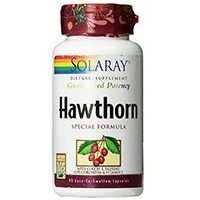 This is a strong hawthorn supplement that uses both berries and a flower/leaf blend. It’s made with organic hawthorn and contains all non-GMO ingredients. Oregon’s Wild Harvest is a natural health product manufacturer based in Oregon. Founded in 1994, they focus on using natural, well-sourced ingredients to create cutting edge supplements. This is a great product at a reasonable price. It’s a potent formula with a blend of berry, leaf and flower. The serving size is 3 capsules, though, so you may find that you run out quickly. Swanson Premium Hawthorn offers 565mg of hawthorn berry in each capsule, and it’s made by one of the industry’s most trusted brands. The other ingredients besides the gelatin capsule are rice flour and magnesium stearate, and it’s priced very affordably. Swanson Vitamins is a large-scale supplement and vitamin manufacturer based in Fargo, ND. Founded in 1969, Swanson has built a reputation for quality products at affordable prices. They now employ over 600 people and sell a wide range of health products. 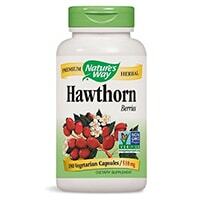 This is an effective hawthorn supplement at a great price. We like the fact that there are no additives or unnecessary ingredients – just pure hawthorn berries! This is a straightforward hawthorn product with a 565mg dose. Puritan’s Pride is a large-scale supplement company with over 40 years of industry experience, and more than 19 million customers served. This is a standard hawthorn product, which is a touch expensive. This is a unique hawthorn product that uses liquid phyto-capsules. The manufacturer claims this liquid formula provides better bioavailability, although there’s no definitive way to say whether or not that’s true. Regardless, this is a great product that’s well received by consumers and offered at a great price. Gaia Herbs is a unique company that grows most of their own herbs and ingredients to be used in their supplements. They have a certified organic farm where they grow ingredients for their 300+ health products. This allows them to control every aspect of the process, ensuring high quality finished products. This is a great product at an affordable price. It’s unclear whether the liquid formula is any different from standard powdered versions but based on customer reviews it’s safe to say that this product has been very effective for a lot of people. 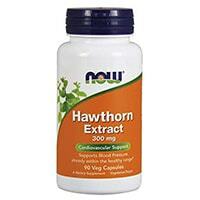 This is a simple hawthorn product with 500mg of hawthorn concentrate in each capsule. It is free of many common allergens. Jarrow Formulas is a Los Angeles-based health product manufacturer that was founded in 1977. 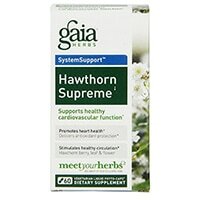 This is a straightforward hawthorn product with a standard dosage amount. There’s nothing particularly unique about it, but it’s a great product nonetheless. This is a simple product with 300mg of hawthorn extract per serving. Its dose is a bit on the low side. This is made by NOW Foods, one of the biggest and best brands in the supplement industry. They manufacturer over 1,400 unique products and follow rigorous quality standards. This is a good product, but the dosage amount is quite low compared to most on this list. This also makes the product a bit expensive when you consider the lower dose. 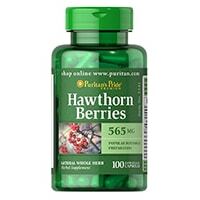 These are some of the best hawthorn pills on the market, with 565mg per serving. Herbal Secrets is a health supplement manufacturer and marketer headquartered in New Jersey. This is a simple, effective product with a fairly strong dose. It’s made using Good Manufacturing Practices. This is a unique product that combines hawthorn with vitamin E, B6, magnesium and more. Solaray is a division of Nutraceutical, a huge multinational supplement and health product manufacturer. This is a good product, although the dose of hawthorn is quite low. It’s unclear whether the other ingredients will improve the efficacy of hawthorn, although they are good nutrients in general. This is a simple formula containing 300mg of hawthorn in each serving. Nutrigold is a supplement company dedicated to producing high quality, non-GMO, allergen free nutritional products. This is a good product that’s free of many common allergens, as well as being vegan and non-GMO certified. With that said, it’s fairly expensive. Hawthorn is a genus of shrubs and trees known as the Crataegus genus. Hawthorn is native to various temperate regions throughout Europe, Asia and North America. Hawthorn has been used in traditional medicine as far back as the first century. Traditionally, components of the hawthorn plant including the berries were used to address heart disease and related cardiovascular ailments. Today, most hawthorn used in supplements and medicine comes from the leaves and flowers, which are used to address a variety of health concerns. Hawthorn has a storied history in traditional and modern medicine. In the 1800’s, American doctors relied on it to treat respiratory illnesses and circulatory disorders, while the plant was used as something of a cure-all in some traditional medicines. Today, it’s mostly used as a dietary supplement. 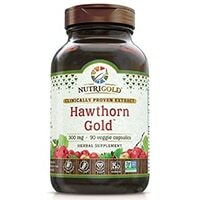 Heart: A recent clinical review of 14 different medical trials found that oral hawthorn supplements helped improve symptoms and heart function in patients with chronic heart failure. Of course, given the seriousness of chronic heart failure, hawthorn is not intended as a standalone treatment option. Blood Pressure: Hawthorn may help to regulate blood pressure levels and has been used to address both high blood pressure and low blood pressure. While research findings are promising, experts agree that more research is needed in this area. Cardiovascular Health: Hawthorn is thought to improve many markers of cardiovascular health, as shown by several studies. It can help regulate blood pressure, improve blood flow, and regulate cholesterol levels – all of these effects can potentially help to improve cardiovascular health. Chest Pain (angina): Preliminary evidence suggests that hawthorn may be useful in addressing angina, or chronic chest pain. This is thought to be related to hawthorn’s effect on blood flow. More research is needed. Other potential uses for hawthorn include addressing digestive issues, anxiety, irregular heart beat, high cholesterol, and more. These hawthorn uses have not been fully evaluated in clinical trials, so more research is needed. Overall, hawthorn shows a lot of promise as a natural remedy for various ailments. It’s mostly used for heart health, and a variety of trials have shown very positive results. With that said, it’s no replacement for pharmaceuticals, especially when dealing with serious conditions like heart disease. Speak to your doctor before using hawthorn. 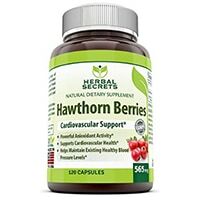 Hawthorn supplements typically come in capsule form, with doses ranging from 400 to 600mg per serving. It’s best to follow manufacturer recommendations, unless told otherwise by your doctor. It can be taken with or without food. It can also be prepared as an herbal tea, if desired. In clinical trials, researchers have utilized hawthorn doses between 160mg to 1800mg per day, divided into 2-3 doses. So, there’s quite a range of potential dosages. The good news is that hawthorn shows a very low potential for side effects, even at high dosages. Hawthorn can interact with certain medications, so it’s important to speak with your doctor if you are taking any prescription medications – particularly any medicines used to treat heart disease. Pregnant women should avoid hawthorn, as there is insufficient evidence to suggest it’s safe for use during pregnancy. 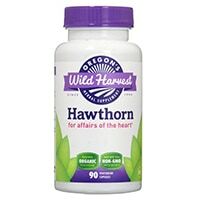 Lastly, it’s important to remember that while hawthorn may help support heart health, it’s no replacement for prescription medications and the advice of a licensed medical professional. If you have heart disease or related concerns, it’s very important to speak with your doctor, and see if it’s possible to work hawthorn into your treatment protocol. A good hawthorn supplement will contain an adequate dose of the plant (usually 500mg or more). It should be made by a reputable, established company with a reputation for quality and consistency. It should be made using either hawthorn berries, hawthorn leaves, or a combination of both. Some hawthorn supplements may contain a blend of other herbal ingredients, thought to support the effects of hawthorn. While these may be beneficial, this creates a bit more potential for side effects and complications. A higher quality hawthorn product should be made without the use of fillers and unnecessary ingredients, and it should provide good value for your money.